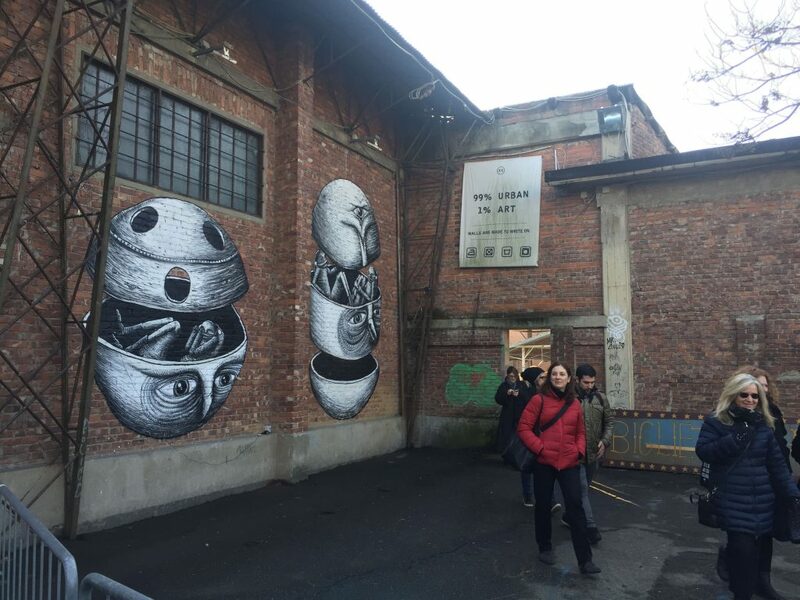 The Bunker is a cultural project launched by The Cultural Association URBE – Urban Regeneration and the Torino Quittengo Srl, owner of the area. Bunker is located near the Vanchiglia Railway Station, decommissioned since the 1980s and to be subject to urban transformation in the coming years. 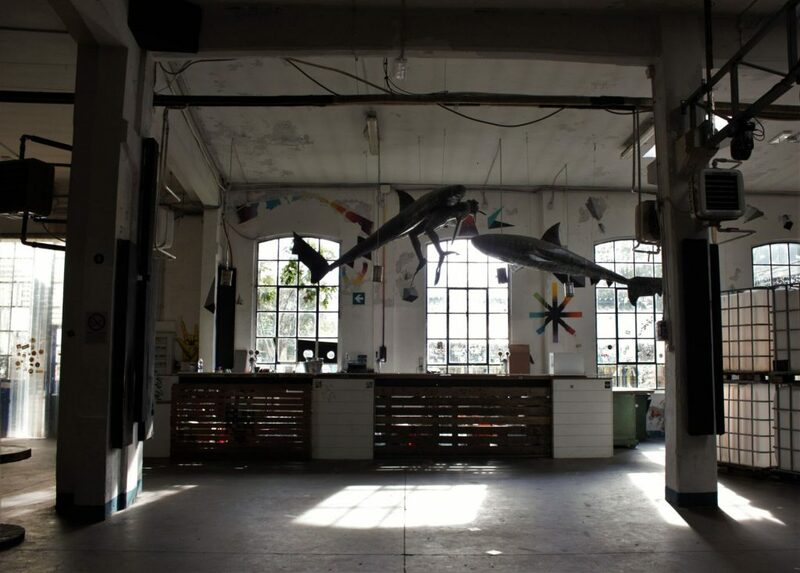 The association Variante Bunker temporary manages the area and, while waiting for the city intervention, it proposes activities that create incentives for bottom up urban re-design. My name is Manuela, and I represent “Variante Bunker”, the association that designs and manages this site. 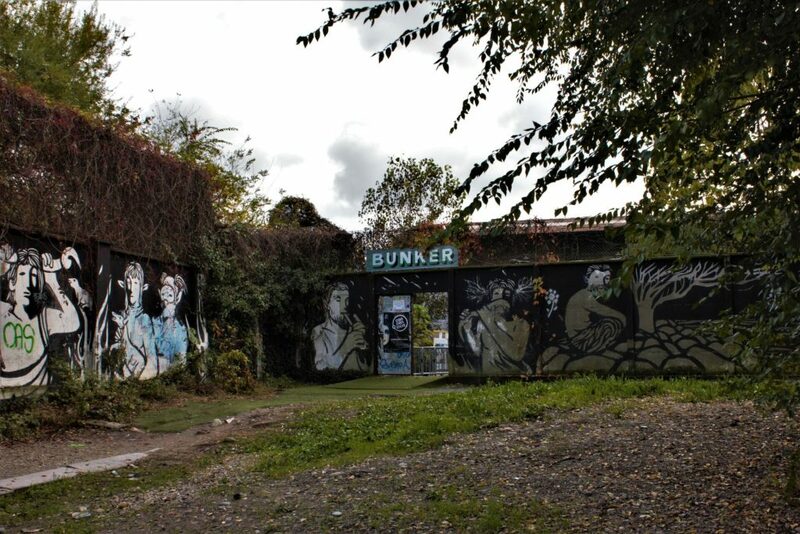 Bunker was established in 2012 and aims to reuse and regenerate private spaces, thanks to a concession agreement with the owner, who is also our co-manager of the structure. It started as a temporary project managed by the Urbe association, that later transformed into Variante Bunker, founded to support the specific characteristics of this project. We wanted to give a new meaning to this area by opening it to the public. Our initial plan was to keep the space open for a trimester however the owner pushed the development of the project in a different direction because of the building proximity to ex Scalo Vanchiglia, an old railway station. This area should be the starting point of Variante 200, a huge infrastructural project dealing with the practicability of the city. It was a way to try activities and services that usually takes place at a later stage of an urban regeneration project in advance – as a matter of fact we have planned an urban garden project, and even created Variante Bunker Sport, an association focusing on sports and leisure activities. This led us to reconsider our project from being a short-term project to a medium to long-term one, and we have now been active for five years. The owner granted us more space, so we have been able to expand our array of activities and adapt the venue according to our needs. We share the venue with other organizations, such as Flic, a professional circus school that organizes training courses for children and public shows, once or twice a month. Another organization is Vertigimn, a school of acrobatics for children and teenagers whose headquarters are in Mottalciata street, but has a venue here. 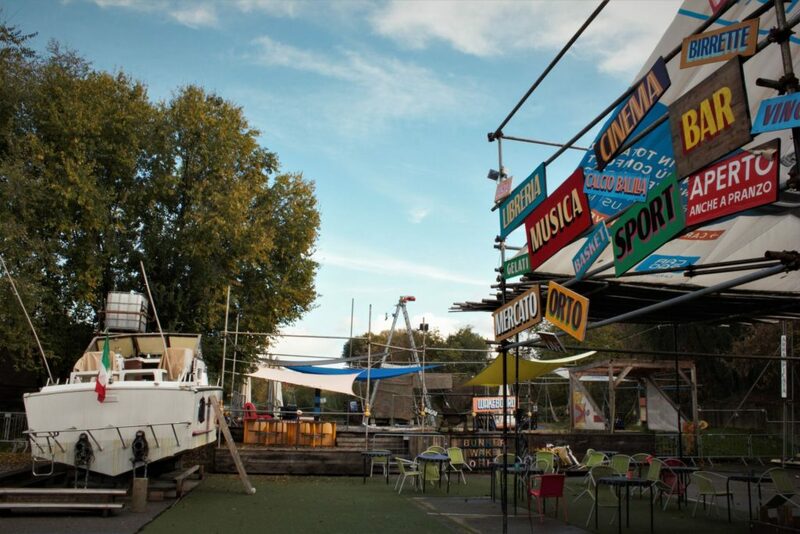 We have padel courts managed in collaboration with Padel Movement Italia, a wakeboard lake managed by Variante Bunker and an art gallery managed by a Not for Profit collective called Cripta 747, that hosts artists from around the world and exhibits their work here once or twice a month. Every area has its own specific vibe. We invited national and international artists to paint different parts of the venue so that today, Bunker’s walls are filled with paintings and installations. We worked with street artists, bringing their art inside a private building. This building hosts most of the music events that take place during the weekends, (Friday to Sunday), opened to various types of audiences. We hosted most of the associations involved in music events in Turin, for a young audience interested in electronic or experimental live sets, but we host other kinds of events, such as tango or Balkan dance nights, once or twice a month. View of Variante Bunker, Torino. Photo by Variante Bunker. Are your activities legal? Do public authorities know about your events? We have a legal framework problem. This was a private space whose activities became public. Though there is legislation for temporary public activities, there’s nothing for long-term projects such as ours. According to the Variante 200 project, we are in a soon-to-be-requalified area, and we are not supposed to change the legal purpose of our venue. This is why we shouldn’t use this area as club or a padel field, unless we derogate from this rule. Until reach an official agreement with the municipality, we will only be getting temporary licenses, renewed each month. We need a new long-term formula, even if it won’t last forever, because some of these buildings will be destroyed during the neighbourhood regeneration to make way for new roads and parhaps a new park. Our aim is to keep the functions of our space, and move to another building while following the urban plans once the big regeneration of the area takes place. The municipality always paid attention to our project due to our approach: we are an association collaborating with a private company, regenerating an area and giving it back to the community for them to enjoy. The city supported and often involved us in public debates. Our main problem with the local government is bureaucracy. For instance, our legal framework is still unclear, and we have been waiting for five years to know if they want to support us as a resource. We are a small group of people working on the field, so it is difficult for us to follow every bureaucratic issue. Does the owner let you use this site for free? In the beginning we had a three-month, free concession agreement, but now we pay a small monthly fee. How does this temporary project fit with a business plan? It is difficult. We can’t plan for five or ten years as most other organizations usually do. We always invested our resources with extreme prudence, managing low budgets with a short-term perspective, because we know the building itself might no longer exist in the future. All your activities could be reproduced elsewhere if needed, is that correct? Exactly. The idea is to transfer our activities to new venues, if needed, and we plan our projects to fit both our present location and our future vision. Organizing shows is our most frequent and profitable activity, because it generates revenue given that we receive no public funding and want to reinvest our income in other activities. Inside Variante Bunker. Photo by Variante Bunker. We are not community centre like the Bagni di via Agliè in our neighbourhood, but we provide the district with different assets: our specific purpose was to offer the people a multi-functional site open throughout the whole day in an area where there was nothing similar. We may say we paved the way for many other projects to start here in Barriera di Milano, even if at first it was very difficult to reach a larger audience. Our main activities, the parties or the wakeboard lake, attract a wide audience, ranging from 18 to 45 or even 50, while other activities such as the tango and circus shows, have a wider age range, yet they don’t take place very frequently. We organize a market, now at its sixth edition, and its audience is growing. The main courtyard where we organize open-air events such as the market, concerts and sports, hosts a big circus tent. It’s the Magda Clan company, founded by ex Flic students. They worked here two years ago, opening their tent to the public, and now they are working on their next show. Many of our outside sports activities are beach-volley and padel, a mix of squash and tennis, open to everyone but which requires paying a membership fee to the sports association. Some sheds open from March or April. 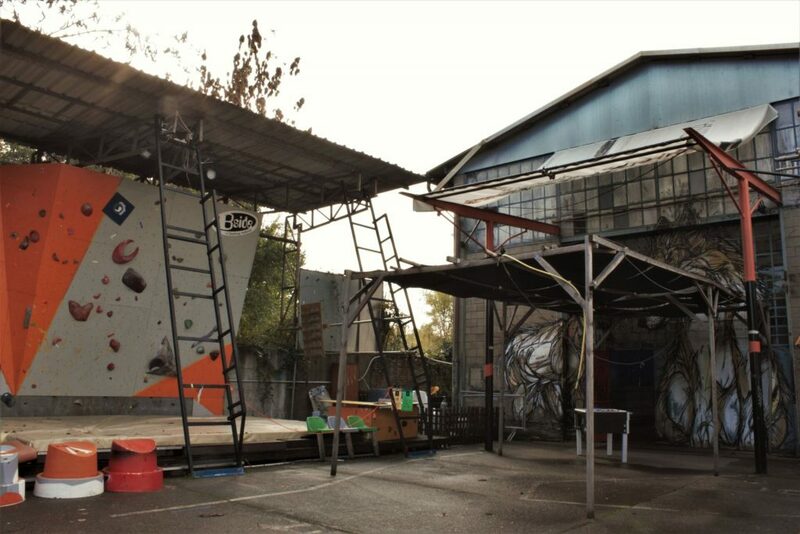 That area features a food point for the sporting area, the wakeboard lake and a climbing wall since last year, built in collaboration with B-Side, a sports association located close by. Wakeboard is similar to snowboarding on water. People are tied to a rope, and a trainer rules their speed, moving along the lake and jumping from the ramps in the middle of the lake. On the other side of the lake, we have the urban gardens, about 40 or 50 plots, granted by request and for free. Students come to learn and practice their gardening, others plots are taken by individual gardeners from the neighbourhood. At first, we had many young gardeners but as gardening requires time and constant attention, adults or elderly people use most of the plots. During the next season we would like to try a new way to manage the whole garden, reducing the single plots and increasing the shared ones, introducing permaculture practices. Does this project have any didactic purpose? We tried to give common rules, but it’s difficult because of the many gardeners. Implementing permaculture might help us improve the appearance and shape of the whole space and encourage the participation of everyone within their means and possibilities. This whole area was the seat of the national telephone company (Sip, now Telecom). Later, Enel, the national electricity company, took its place, and these were their employees’ gardens. The company even helped us rehabilitate the area by giving us a donation. Did the political turn in the municipality influence your activities? We keep on working as usual, so the new administration did not influence our activities. We have patronage by the district authority and have had no conflicts. They support us, involving us in their activities, and they often send us volunteers or new associations to help. Who owns this plot of land, and why do they invest their money in this? This area is owned by a company called Torino Quittengo srl., and the first association involved here was Urbe. Urbe’s first temporary project was in via Foggia, in the neighbouring Aurora district, where they regenerated private property in just a month. It was a big success, and they received a positive media reaction. Bunker’s owner knew the project and asked Urbe to visit this site to repeat the same experience here. He was much more oriented towards visual and performing arts rather than handicraft, even if we built up the structure with recycled materials and thanks to a great team of blacksmiths and carpenters. What type of company owns the place? It’s a real estate company. Even if they generate little revenue from the site itself, they could use this as a pilot project for their business, a way to experiment and reproduce its results in commercial areas. Of course. This was their aim, and it served our goals. How much have you invested here over the course of the years? Our first investment was on the artists. We had to pay travel refunds, materials and compensations. Then the biggest one has been on the urban gardens, we covered that thanks to the bar’s revenue in one and a half years together with a small contribution from Enel. I can’t say how much money we invested, but we have always been careful with our expenses. Economy, Environment, Turin , circular economy, civic space, commons, cooperative, economy, temporary use.